The ADA-compliant ML300 is the newest pool lift offering from S.R. Smith, a leader in pool lift deck equipment. The ML300 features a 300-pound lifting capacity and the LiftOperator™ control system with an ergonomically designed hand control. The ML300 is flange-mounted and ideal for a wide range of pool applications. 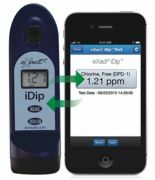 The new eXact® iDip™ by Industrial Test Systems provides complete wireless connectivity between the iPhone®, iPad® and iPod Touch® and a handheld photometer. Data is seamlessly transferred between the two devices when paired with the eXact® iDip™ using Bluetooth® Smart wireless technology. The application stores the test results history of multiple pool, spa and water sources. Test data can be shared via e-mail and a built-in GPS feature allows for easy retrieval of water locations. StageTek™ staging provides flexibility for various events, from simple platforms to complex multi-level stages. Deck-and-leg design offers fast and easy setup without tools or folding frames; built-in grips improve deck handling. Compared with Z-frame systems, StageTek requires less assembly time and a smaller storage footprint. StageTek staging is engineered to safely support heavier loads while satisfying uniform, point and dynamic load requirements. This patent-pending stage features field-reparable components and a 10-year warranty. Head Rush Technologies announced the launch of the quickJump Free Fall Device. The quickJump incorporates the company's patented eddy current magnetic braking technology to provide riders with an exciting and unique experience, combining the thrill of a free fall while comfortably controlling their descent. The quickJump Free Fall Device provides an exciting amusement ride element with high throughput and low operational costs to operators of amusement parks, family entertainment centers, adventure parks, shopping centers, resorts, ropes courses and more. ChlorKing's NEX-GEN is the commercial swimming pool industry's first on-site chlorine generator with neutral pH chlorine. 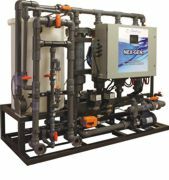 This unique system re-uses the swimming pool water so TDS is never an issue, and requires no water softener. NEX-GEN is available in 5, 7.5, 10, 20, 40 and 80 pound per day models. Why buy and store chlorine when you can make it on-site from as low as 43 cents per gallon. FJM Security Products announced an updated style of the Combi-Ratchet, sliding door combination ratchet lock, now with four dials and 10,000 possible combinations. The sliding door lock offers keyless convenience for a variety of uses such as retail display cases, trophy cases, showcase displays and more. Employees can set their own codes, and the manager controls all locks with one master key. The master key allows code discovery and the ability to change to a new combination if employees quit or forget their code.